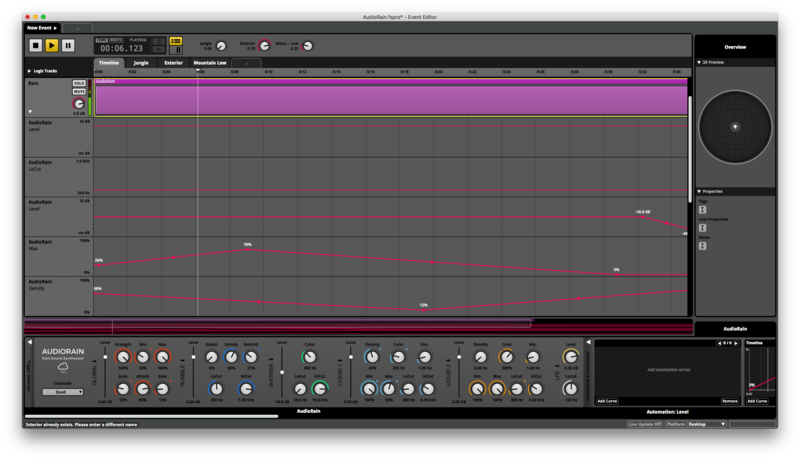 AudioRain FMOD is a synthesizer dedicated to creating rain sounds. The synthesizer is based on procedural audio technology which allows full control of dynamic sound evolution in real-time. 1 - Rumble synthesizes the drops ensemble when they hit a hard surface. 2 - Shower synthesizes the background sound of the rain. 3 - Liquid One synthesizes the distinguishable drops when they hit softer surfaces such as a puddle. 4 - Liquid Two also synthesizes liquid sound complementary to Liquid One. Just load the plugin and select the preset you need - the job is almost done. The factory presets cover various scenarios from raindrops to shower, all available within a simple click. Thanks to its procedural nature, AudioRain is flexible for painless project change and adaptation. It also allows audio integration at an early stage and fast porting to various platforms.